Our Pole Crash Mats will assist in the safe execution of pole dance fitness and are easy to install. 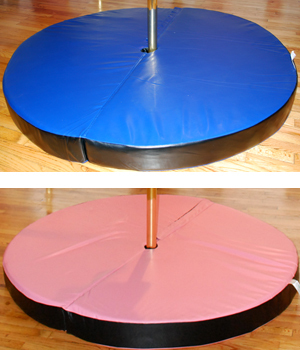 Available in 4 different colors and 3 different sizes, we have the pole crash mat that you have been looking for. It wraps around all dance poles in seconds! These crash mats have the cushioning to help you practice new and challenging exercises without worry. Made of durable PVC, these mats are sure to last through anything you can put it through. They are water resistant with a quad fold design for easy storage. Enjoy the latest exercise and dance craze safely while having fun doing it. Our Pole Crash Mats will assist in the safe execution of pole dance fitness and are easy to install. Wraps around all dance poles in seconds! The quality of the mat itself is great! I got the pink, 4 inch mat. It makes me feel a lot more comfortable practicing different moves in my apartment. Especially as I live alone and don't always have someone to spot me. There was a small scratch/cut in the plastic of my mat on arrival. Fits very well around my Xpole Stage Lite. The shipping takes a bit longer to Canada (I think it took 2 weeks total) as it was never sent from their canadian warehouse, but customer service was really helpful. I purchased the pink 5 inch mat. Love my new mat and the security it gives me to work on some new tricks. It has definitely come in handy on inverts and just being able to let go if needed. It breaks my fall perfectly!